This chapter provides information on setting up the ADF Mobile environment for application development and deployment. Section 3.1, "Introduction to the ADF Mobile Environment"
Section 3.2, "Prerequisites for Developing ADF Mobile Applications"
Section 3.3, "Setting Up JDeveloper"
Section 3.4, "Setting Up Development Tools for iOS Platform"
Section 3.5, "Setting Up Development Tools for Android Platform"
Section 3.6, "Testing the Environment Setup"
Before developing an ADF Mobile application, you must set up your development environment by downloading, installing, and configuring various software components. To set up your development environment, follow steps described in Section 3.2, "Prerequisites for Developing ADF Mobile Applications", and then prepare a mobile device or its simulator. Oracle JDeveloper (see Section 3.3, "Setting Up JDeveloper"). For more information, see Section 3.4, "Setting Up Development Tools for iOS Platform." For more information, see Section 3.5, "Setting Up Development Tools for Android Platform." You do not need to install any additional tools for creating specific types of ADF Mobile application content (HTML, remote URL,or ADF Mobile AMX). For more information, see Section 5.10, "Defining the Content Types for an Application Feature." Since PhoneGap was absorbed by Apache Cordova, if you have any PhoneGap plug-ins installed, you need to perform the migration to Cordova 2.2 versions of those plug-ins. All components listed in Section 3.2.1, "What You Need to Create an Application." Various login credentials. For more information, see Chapter 17, "Deploying ADF Mobile Applications." Optionally, an iOS-powered or Android-powered device. Oracle JDeveloper and its ADF Mobile extension are essential tools used in developing ADF Mobile applications. Consult the Certification and Support Matrix for Oracle JDeveloper and ADF to find out which release of Oracle JDeveloper is compatible with software listed in Section 3.2.1, "What You Need to Create an Application" for your target platform. 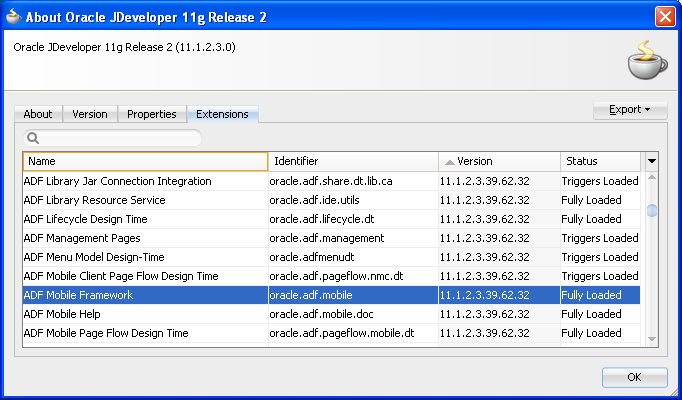 Download and install the appropriate release of Oracle JDeveloper. Select the Studio Developer (All Features) role when prompted. If your target platform is iOS, see the section about using Oracle JDeveloper on the Mac OS X platform in Oracle Fusion Middleware Installation Guide for Oracle JDeveloper. If your target platform is Android, see Oracle Fusion Middleware Installation Guide for Oracle JDeveloper. In JDeveloper, choose Help, then Check for Updates, and then click Next. You might need to configure proxy settings by selecting Tools > Preferences from the main menu, and then Web Browser and Proxy from the tree on the left of the Preferences dialog. 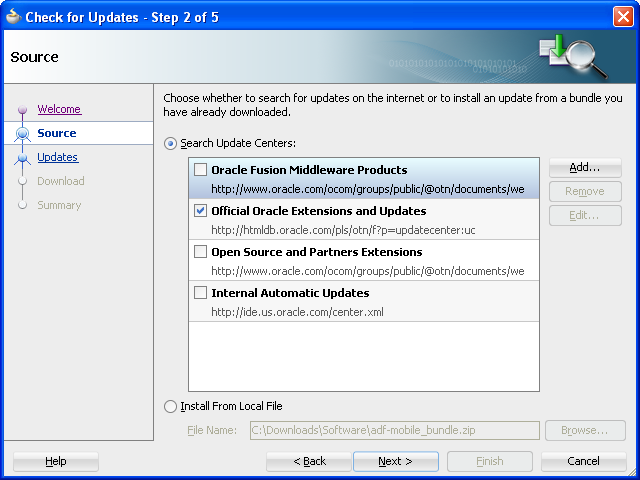 In the Source page that Figure 3-1 shows, select Official Oracle Extensions and Updates under the Search Update Centers, and then click Next. Alternatively, if the network access is not available, you can select the Install From Local File option. In this case, you need to point to the ADF Mobile extension file that you already downloaded to a directory on your development computer. In the Updates dialog, select the ADF Mobile update. 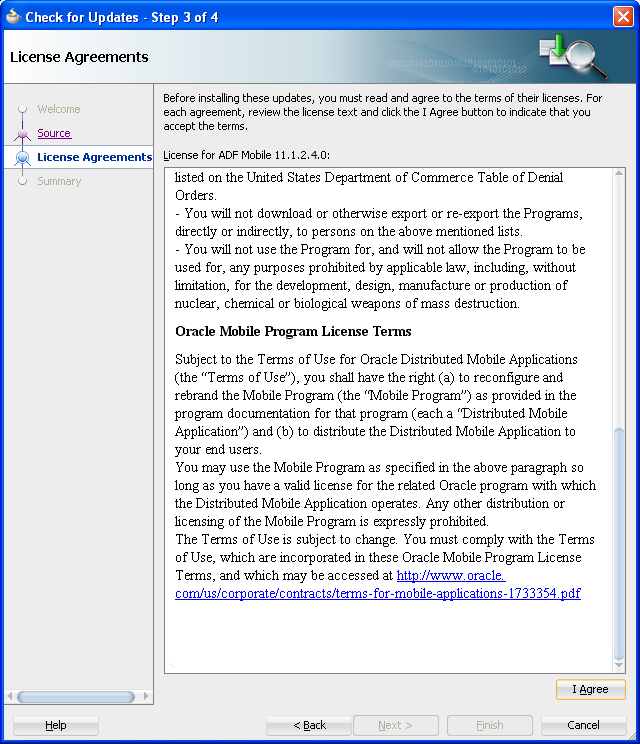 In the License Agreements page, shown in Figure 3-2, review The Oracle Technology Network License Terms for Oracle Mobile. You must comply with all of the license terms and conditions with respect to the Oracle ADF Mobile Program available at http://www.oracle.com/technetwork/indexes/downloads/index.html. Select File > New from the main menu to open the New Gallery. Select the All Features tab. In the Categories pane, expand the Client Tier node and make sure it contains ADF Mobile (see Figure 3-3). In addition, verify that you installed the correct version of ADF Mobile. To do so, select Help > About from the main menu, then select the Extensions tab on the About Oracle JDeveloper dialog, and then examine the extension list entries by scrolling down to ADF Mobile, as Figure 3-4 shows. In addition to the preceding steps, your development environment must be configured for target platforms and form factors. For more information, see Section 3.3.1, "How to Configure the Development Environment for Platforms and Form Factors"
Before you start developing an ADF Mobile application, you must configure JDeveloper Preferences for appropriate platforms (see Section 3.3.1.2, "Configuring the Environment for Target Platforms") and form factors (see Section 3.3.1.1, "Configuring the Environment for Form Factors"). A form factor is a specific device configuration. Each form factor is identified by a name that you specify for it and contains information on the specified resolution denoted by pixel width and pixel height. Form factors defined in preferences are used in the ADF Mobile AMX page Preview tab (see Section 6.3.2.2, "Using the Preview"). You can select or switch between various form factors to see how an ADF Mobile AMX page is rendered in various form factors. You can also see multiple form factors applied to the same page using the split screen view. For more information, see Section 5.12.1, "About the adfmf-config.xml File." Download and install JDeveloper and the ADF Mobile extension, as described in Section 3.3, "Setting Up JDeveloper." Open Preferences by selecting Tools > Preferences from the main menu in JDeveloper. In the Preferences dialog that Figure 3-5 shows, select ADF Mobile from the tree on the left. The ADF Mobile page is populated with default settings. This preference page allows you to create and manage a set of named form factors that combine a screen resolution size and platform. Name: a meaningful string that is used to identify the form factor. Platform: the platform of the mobile device. Model: the type of the mobile device. Default Orientation: the default device orientation used in the ADF Mobile AMX page Preview tab. It might be Portrait or Landscape. Select this setting from the drop-down list of values. The default value is Portrait and it is prepopulated during creation of the new form factor. Resolution Width: width, in pixels. This value must be a positive integer, and its input is validated. Resolution Height: height, in pixels. This value must be a positive integer, and its input is validated. Scale Factor: the display scale factor. This value must be either one of 1.0, 2.0, or 3.0. If you do not set the name and resolution for your form, ADF Mobile will display an error message. If you need to revert to default settings, click More Actions > Restore Defaults. Click OK to finalize your settings. To start developing for one of the platforms supported by ADF Mobile, you need to provide JDeveloper with such information as the name of the platform and directories on your development computer that are to house the platform-specific tools and data. Select Tools > Preferences from JDeveloper's main menu to open Preferences. 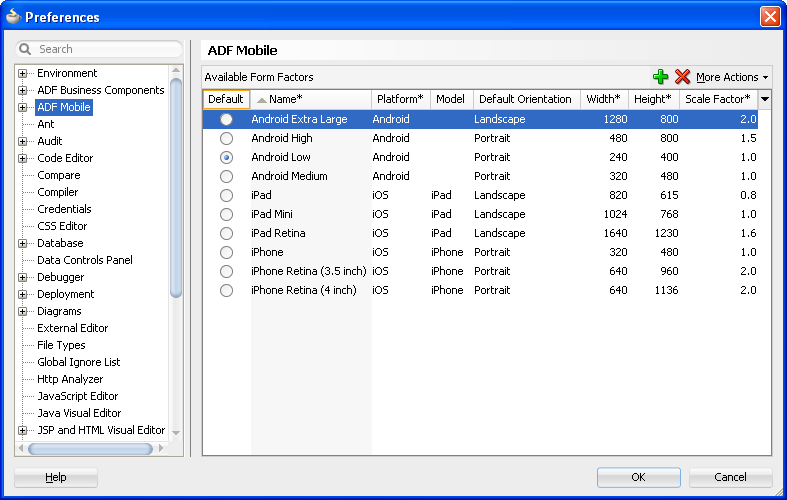 In the Preferences dialog that Figure 3-5 shows, select ADF Mobile from the tree. The ADF Mobile page that opens is populated with default form factor settings. 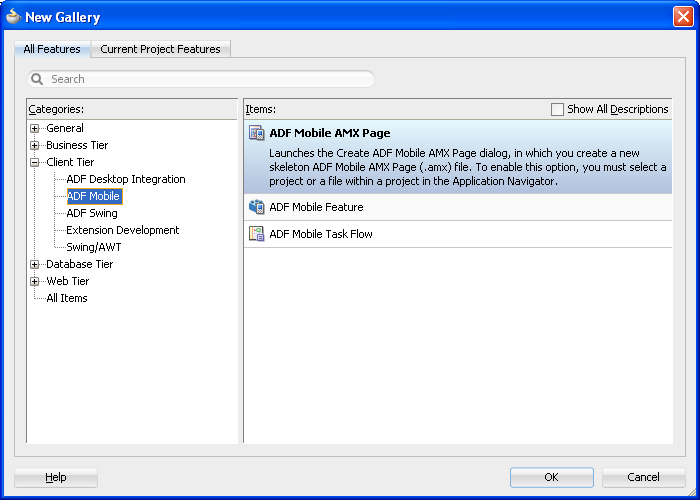 Select Platforms from the tree to open the ADF Mobile: Platforms page that contains the path and configuration parameters for the supported platforms, as Figure 3-6 and Figure 3-7 show. If you select Android from the list of supported platforms, specify the Android SDK location on your computer, the local directory of your target Android platform, and provide information on the signing credentials (see Figure 3-6). 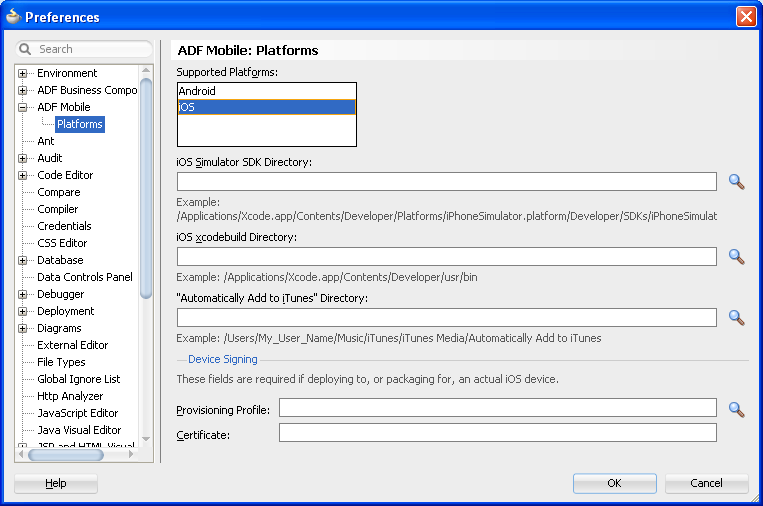 In addition to general-purpose tools listed in Section 3.2, "Prerequisites for Developing ADF Mobile Applications," you might want to set up an iPhone or iPad when getting ready for development of an ADF Mobile application for the iOS platform (see Section 3.4.3, "How to Set Up an iPhone or iPad"). Since iPhone and iPad simulators are included in the iOS SDK installation, you do not need to separately install them. For more information, see Section 3.4.4, "How to Set Up an iPhone or iPad Simulator." You download Xcode from http://developer.apple.com/xcode/. After installing Xcode, you have to run it at least once and complete the Apple licensing and setup dialogs. If these steps are not performed, any build and deploy cycle from JDeveloper to Xcode or device simulator will fail with a "Return code 69" error. Since older versions of Xcode are not available from the Mac App Store, in order to download them you must obtain an Apple ID from http://appleid.apple.com, and then register this Apple ID with the Apple Developer Program to gain access to the Apple developer site at http://developer.apple.com. You download iOS SDK from the iOS Dev Center at http://developer.apple.com/devcenter/ios/. Since older versions of iOS SDK are not available from the Mac App Store, in order to download them you must obtain an Apple ID from http://appleid.apple.com, and then register this Apple ID with the Apple Developer Program to gain access to the Apple developer site at http://developer.apple.com. In your ADF Mobile application development and deployment, you can use either the iPhone, iPad, or their simulators (see Section 3.4.4, "How to Set Up an iPhone or iPad Simulator"). If you are planning to use an actual iPhone or iPad, which is preferable for testing (see Section 19.2, "Testing ADF Mobile Applications"), you need to connect it to your computer to establish a link between the two devices. To deploy to an iOS-powered device, you need to have an iOS-powered device with a valid license, certificates, and distribution profiles. For more information, see Chapter 17, "Deploying ADF Mobile Applications." Since Apple's licensing terms and conditions may change, ensure that you understand them, comply with them, and stay up to date with any changes. In your ADF Mobile application development and deployment, you can use either the iOS-powered device itself (see Section 3.4.3, "How to Set Up an iPhone or iPad") or its simulator. Deploying to a simulator is usually much faster than deploying to a device, and it also means that you do not have to sign the application first. A simulator can be invoked automatically, without any additional setup. Before attempting to deploy your application from JDeveloper to a device simulator, you must first run the simulator. If you are planning to use web services in your application and you are behind a corporate firewall, you might need to configure the external network access. You do so by modifying the network settings in the System Preferences on your development computer. For more information, see the "Setting Browser Proxy Information" section in Oracle Fusion Middleware Fusion Developer's Guide for Oracle Application Development Framework. In addition to the general-purpose tools listed in Section 3.2, "Prerequisites for Developing ADF Mobile Applications," you might want to set up an Android-powered device when getting ready for development of an ADF Mobile application for the Android platform (see Section 3.5.2, "How to Set Up an Android-Powered Device"). Since emulators are included in the Android SDK installation, you do not need to separately install them. However, you cannot use an emulator until you create its configuration. For more information, see Section 3.5.3, "How to Set Up an Android Emulator." To develop for the Android platform, you can use any operating system that is supported by both JDeveloper and Android. For more information, see the "Developer Tools" section of the Android Developers website at http://developer.android.com/tools/index.html. Android SDK includes development tools that you need to build applications for Android-powered devices. Since the Android SDK is modular, it allows you to download components separately depending on your target Android platform and your application requirements. When choosing the platform, keep in mind that ADF Mobile supports Android 2.3 or later. Ensure that your environment meets the operating system, JDK version, and hardware requirements listed in the "Get the Android SDK" section of the Android Developers website at http://developer.android.com/sdk/index.html. Ant, Eclipse, and Linux requirements are not applicable to the ADF Mobile development environment. Download the Android SDK starter package from http://developer.android.com/sdk/index.html. Complete the installation by following the instructions provided in the "Setting Up an Existing IDE" section of the Android Developers website at http://developer.android.com/sdk/installing.html. 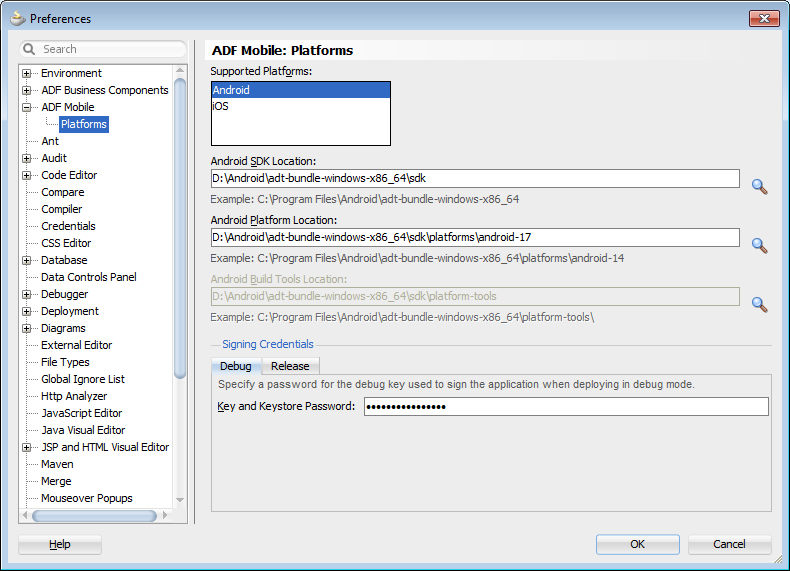 Skip step 3 in the Android SDK installation instructions, as configuring Eclipse is not required for the ADF Mobile application development. In your ADF Mobile application development and deployment, you can use either the Android device itself, which is preferable for testing (see Section 19.2, "Testing ADF Mobile Applications"), or an emulator (see Section 3.5.3, "How to Set Up an Android Emulator"). For information on how to set up the Android-powered device, follow the instructions from the "Using Hardware Devices" section of the Android Developers website at http://developer.android.com/tools/device.html. You might experience issues when using USB connectivity for the device-based debugging. For more information, see Section 19, "Testing and Debugging ADF Mobile Applications." Find the correct values for your device. Update the [Google.NXx86] and [Google.NTamd64] sections of the android_winusb.inf file. For more information, see the "Google USB Driver" section of the Android Developers website at http://developer.android.com/sdk/win-usb.html. In your ADF Mobile application development and deployment, you can use either the Android device itself (see Section 3.5.2, "How to Set Up an Android-Powered Device") or its emulator. Deploying to an emulator is usually much faster than deploying to a device, and it also means that you do not have to sign the application first. 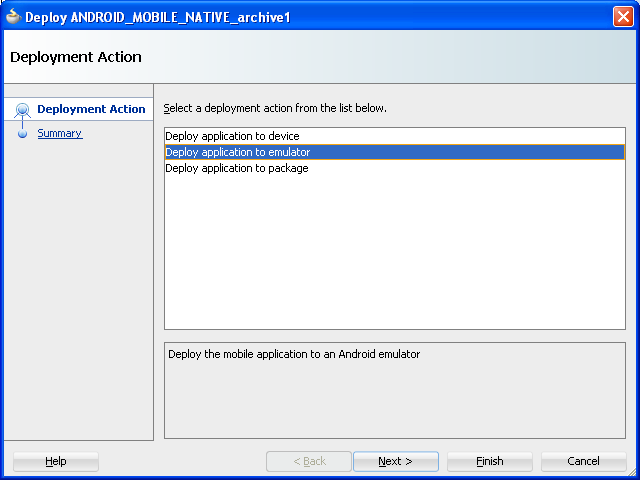 For information on how to create an emulator configuration called Android Virtual Device (AVD), follow the instructions from the "Managing Virtual Devices" section of the Android Developers website at http://developer.android.com/tools/devices/index.html. You need to create an AVD for each Android platform on which you are planning to test your application. For information on how to use the emulator, see the "Using the Android Emulator" section in the Android Developers website at http://developer.android.com/tools/devices/emulator.html. You may find it useful to be able to save the emulator state or reuse the saved state. To do so, you manipulate the avd files or folders that are located in the C:\Users\username\.android\avd directory (on a Windows computer). Each avd folder contains several files, such as userdata.img, userdata.qemu.img, and cache.img. You can copy the cache.img file to another emulator's avd folder to use that state with another emulator. Alternatively, you can run commands listed in Table 3-1 from the command line. File that contains all the emulator state snapshots. Disables all of the emulator state snapshot functionality by preventing a snapshot storage file from being mounted. Name of the emulator state snapshot within the storage file for the autostart and autosave. Performs a full boot without performing autosave; vmload and vmsave operate on snapstorage. Does not autosave to snapshot on exit; abandons the changed state. Shows a list of available snapshots. Does not try to correct the snapshot time on restore. Resets the use data image by copying it from initdata. When using this utility, keep in mind that in the process of loading, all contents of the system, including the user data and SD card images, will be overwritten with the contents they held when the snapshot was made. Unless saved in a different snapshot, any changes will be lost. From the Android emulator, you can access your host computer through the 10.0.2.2 IP. To connect to the emulator from the host computer, you have to execute the adb command from a command line on your development computer or from a script to set up the port forwarding. In this example, from the host computer, the client would connect to localhost:8555 and communicate through that socket. For more information, see the "Android Debug Bridge" section in the Android Developers website at http://developer.android.com/tools/help/adb.html. In JDeveloper, open the HelloWorld sample application. For more information, see Section 2.7, "Sample Applications" and Appendix F, "ADF Mobile Sample Applications." Select Application > Deploy from the main menu. From the drop-down menu, select the deployment profile for the platform to which you wish to deploy the application. For iOS, select Deploy application to simulator, as Figure 3-8 shows. 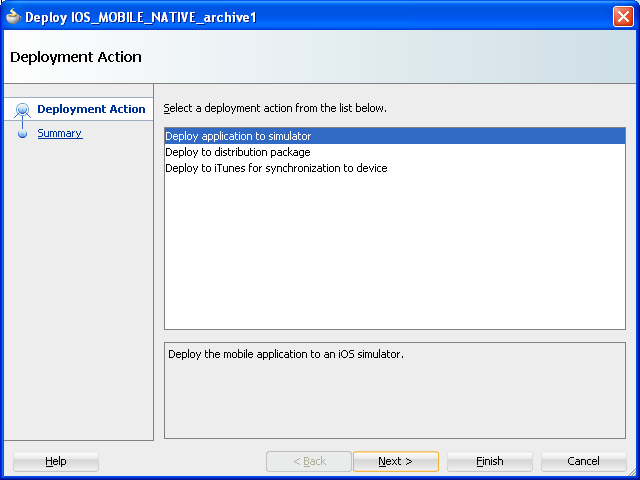 For Android, select Deploy application to emulator, as Figure 3-9 shows. Ensure that the emulator is running before you start the deployment. Click Next on the Deploy dialog to verify the Summary page, and then click Finish. For more information on deployment, see Chapter 17, "Deploying ADF Mobile Applications."